The environment affects children differently from adults. The World Health Organisation (WHO) has reported that children breathe in more air, drink more water and eat more food per unit of body weight than adults. Due to their size, physiology and behaviour, children are more heavily exposed to toxins in proportion to their body weight, and have more years of life exposed to environmental hazards. Children's central nervous, immune, reproductive, and digestive systems are still developing. At certain early stages of development, exposure to environmental toxicants can lead to irreversible damage. Children's bodies may not be able to break down and get rid of harmful contaminants that enter their bodies. Glutathione plays a key role in boosting immunity among children. Glutathione aids in the production of immune cells which are needed in destroying foreign pathogens. Children supplementing with glutathione will be building a strong immune system that will fight off infection and not allow the build-up of heavy metals in the body. Glutathione is also a master antioxidant that neutralizes free radical damage to the body. For example, healthy levels of glutathione in your eyes protects membrane integrity in the cornea, maintain normal hydration level in the eyes, and help in warding off dryness and early onset of short-sightedness. Low levels of glutathione also associated with Autism. Research shown that glutathione precursors can aid children with symptoms of autism spectrum disorders. 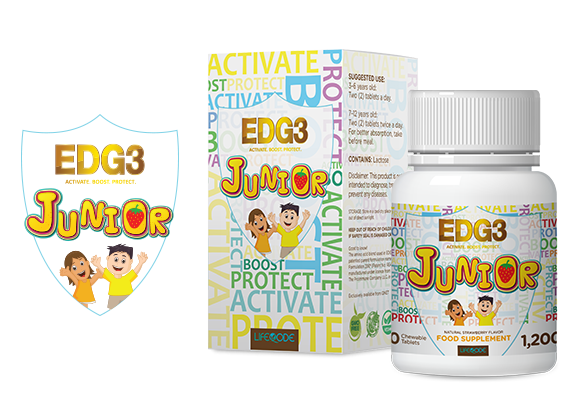 EDG3 Junior is made from US-patented amino acid blend used in EDG3, which are the key nutrients for our body to generate glutathione in the body. This formula works better than vitamin C in building a stronger immune system among children because glutathione works from inside your cell. It is the cell guardian that protect their DNA from environmental toxin damage. Moreover, glutathione can recycle vitamin C and make it work better and longer. Every day, your body uses up the glutathione in your body for daily metabolic processes. Hence, it is important for your children to consume the right nutrients needed for daily glutathione production. EDG3 Junior is formulated by renowned research scientist and physician, Dr Albert Crum, a Harvard alumnus. It is easily absorbed by the body and, owing to its unique technology, has been clinically proven to effectively improve children’s immunity and to protect their brain and nervous system development. Children, ages 7 to 12: Take two (2) tablets in the morning, and two (2) tablets in the afternoon. Ages 6 and below: Please consult physician first.